Wetland drainage, an express road, a ski-resort & tourism development zones imminently threaten ancient Lake Ohrid, National Park Galichica & the UNESCO Ohrid-Prespa Biosphere Reserve. 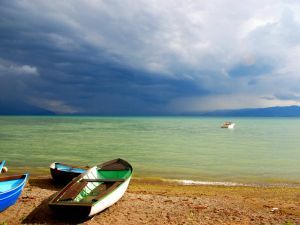 The government of the Republic of Macedonia is pursuing an aggressive urbanization and development drive to exploit the UNESCO Ohrid-Prespa Biosphere Reserve for mass-market tourism. Plans that will directly impact the globally unique ecosystems of two ancient lakes and one of Europe's most biodiverse mountains, National Park Galichica, include an express road; railroad; marina; ski-resort; numerous lake-shore constructions; and the drainage and cementing of Studenchishte Marsh, the last remains of a vital, lake-filtering wetland. These ecologically reckless activities will impact upon habitats of recognized international importance. Known as a museum of living fossils and theater of evolution with over 200 species that exist nowhere else on the planet, Lake Ohrid is thought to be the most biodiverse inland water on Earth by surface area. It is also the epicenter for most of the development projects. Meanwhile, karstic National Park Galichica, proposed site of the express road and ski resort, is an Emerald Site, Important Plant Area, and, with upwards of 1,500 lepidoptera taxa, a Prime Butterfly Area too. Its 50 plus kinds of mammal include the Balkan chamois, gray wolf, brown bear, and potentially Balkan lynx, which, with less than 50 individuals still in existence, is one of the most endangered cat species worldwide. The area's incredible ability to convey wildlife is in stark contrast to its low potential as a winter sports playground: The combination of few days annually with appropriate weather conditions and the karstic profile of the mountain make it largely unsuitable for a ski-resort. Reacting to the development plans, UNESCO has warned that the projects would represent a case for inscription of the property on the List of World Heritage in Danger. In other words, the region's iconic status may soon be lost. Activists have come under pressure from authorities to discontinue their support for environmentally sustainable solutions. One has been criminally charged, but the charges were later dropped upon a series of police interviews; another received warning at work; a third was advised by members of the ruling party to desist. Comments submitted by OhridSOS as part of an official public consultation process for the express road, ski-resort and several tourism development zones have disappeared and were replaced with a substitute document. Despite requests for an explanation, none has been provided by authorities, the EBRD or Citrus Partners LLP. In addition, 604 hectares from National Park Galichica's Zone of Active Management will be illegally reduced to Zone of Sustainable Use (although other ZSU areas will be upgraded). One reason for the rezoning is to accommodate a 26km express road from the town of Ohrid to the state border. Another is to convey 15km of ski-pistes. Because natural snowfall is inadequate, 104,500 m³ of water will be required per season to facilitate the production of artificial snow. The source of this water is yet to be identified. Biodiversity offsets have been proposed for some of the habitat loss. However, not only does Macedonia lack the robust experiential and legal framework for such measures, but the methodology proposed is unproven, designed for another country, and unsuitable for a national park with such high species richness. Indeed, several particularly sensitive or unique habitats are impossible to offset, or have no identified area in which offsets can be implemented. Other The Ohrid-Prespa region contains countless endemic species and its ecosystems are a scientific treasure-box for numerous fields of research including evolutionary biology, biomimicry, paleoclimatology, paleoecology and even medicine. UNESCO status for the Biosphere Reserve may be lost. Activists have come under pressure from authorities to discontinue their support for environmentally sustainable solutions. One has been criminally charged, but the charges were later dropped upon a series of police interviews; another received warning at work; a third was advised by members of the ruling party to desist. Comments submitted by OhridSOS as part of an official public consultation process for the express road, ski-resort and several tourism development zones have disappeared and were replaced with a substitute document. Despite requests for an explanation, none has been provided by authorities, the EBRD or Citrus Partners LLP. Development of Alternatives Prof. Stefan Bouzarovski of the University of Manchester in cooperation with Macedonian NGO Ekosvest has created a SMART Ohrid concept vision as an alternative to the proposed national park express road. It intends to reduce traffic volume with provision of green public transport and toll zones for cars. Alternatives to the construction of a ski-resort and lakeshore infrastructure for mass tourism focus on nature, culture, adventure, archaeology, geology and ecological tourism as higher value, lower impact options. The Ohrid-Prespa region demonstrates firm potential in these sectors due to its UNESCO status for both culture and nature; specific geological composition; ecological bounty; long history as one of the earliest inhabited regions of Europe; and dramatic scenery. Instead of draining Lake Ohrid's last wetlands, placing them at the center of an archaeo-ecological attraction has been suggested. This would involve the development of a visitor center to explore the Galapagos-like ecosystems of the region incorporating three diverse yet related features: an area of pre-Christian water worship at the site of a Byzantium church; an unique karstic spring; and the Studenchishte Marsh wetlands that are so vital to the ongoing ecological integrity of Lake Ohrid. In addition, further encouragement of scientific research is also necessary both to access the wealth of knowledge locked within Ohrid-Prespa ecosystems and to diversify the regional economy. Why? Explain briefly. The quest for environmental justice can only be considered a success when the projects threatening the UNESCO Ohrid-Prespa Biosphere Reserve have been abandoned. Right now, they remain imminent. Prof. Dr. Jos Verhoeven, Society of Wetland Scientists' European Chapter President, explains the need to conserve Lake Ohrid's Studenchishte Marsh wetland. Prof. S. Buzarovski of the University of Manchester outlines smart, green alternatives to the proposed National Park Galichica express road.